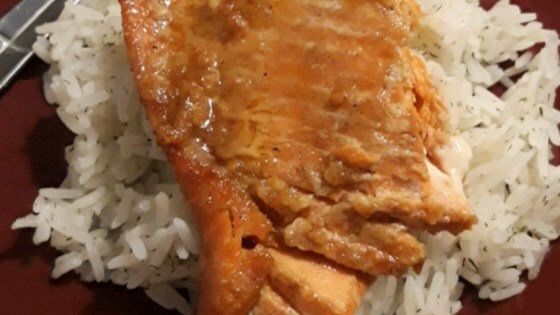 "Wild salmon is marinated and baked in an Asian-inspired soy and sesame sauce, served with hot cooked rice." Make several shallow slashes in the skinless side of the salmon fillets. Place fillets skin-side down in a glass baking dish. In a medium bowl, whisk together the olive oil, rice vinegar, soy sauce, brown sugar, garlic, pepper, onion and sesame oil. Pour the liquid over the salmon, cover, and refrigerate for 1 to 2 hours. In a medium saucepan, combine the rice, water, and dill weed. Cover pan, bring to a boil, then reduce heat to low and cook 20 minutes, until rice is tender and water has been absorbed. Allow to stand for 5 minutes before removing lid and fluffing rice with a fork. Remove cover from salmon, and bake the fish and the marinade for about 30 minutes, or until fish can be flaked with a fork. Serve salmon over the rice, and pour sauce over. OK, but sort of boring.